This is the second of five short stories by Jessica, set in the world of Madrahar before the events of the Orphaned Gods series. Illustration by Ruth! Aturi climbed the stairs to his new dormitory room, clutching the bundle of student robes he’d been issued. After a busy day of examinations, orientations, and a whirlwind tour of not just the Tower of Elemental Harmony but all five towers of the Shiahan University, Aturi wasn’t sure what he wanted more, to finally sit down and catch his breath or to run right back to the university library—three whole stories full of books!—and curl up in a corner to read something he’d never known existed until today. The orientation tour leader had assured all the new students that they were allowed to borrow as many books as they could carry, but Aturi didn’t quite believe that. Bright globes powered by fire magic lit the staircase. Aturi wondered if they stayed on constantly, or if someone had the tedious job of casting the spells to turn them on and off. At the top of the stairs a narrow hallway papered in sober tan ran right and left. Floors, walls, and ceilings all met in crisp, measured edges, rather than the curves Aturi was used to. No colorful borders or decorations were to be seen, just a small, neat scroll hanging beside each door. Aturi checked the numbers on the doors and examined the scrolls. They showed peaceful views of the ocean, painted in a bland foreign style, each with a saying by a famous mage, written in Shian script. “Excel in your studies and your future career will be secure,” the first scroll said, beside the door to room 21. Aturi tucked his bundle of robes under his arm, balanced his rule-book, class schedule, and supplies list atop them, and tried his key. It turned smoothly. Inside, sunlight filtered through a slatted window onto a clean wooden floor, bare walls, a rolled-up bedroll—and over on the other side of the room, a rolled-out bedroll with someone sleeping in it. He didn’t think his roommate was supposed to be here yet. No one had told him so. Could an unauthorized person have snuck into the dormitory, past the bored-looking door guard? Cautiously, he set his robes down and eased his pack off his back. None of these sounds woke the sleeper. Aturi tiptoed to the window and turned the slats to let in more light. In the sudden stream of sun, he could see that the sleeping figure was a young man somewhere around his own age, with thick locks of black hair pulled back in a tail, and skin a bit warmer and darker in tone than Aturi’s own. He wore short trousers and a funny shirt that seemed to be made of fishnet. A black student’s robe, similar to Aturi’s but for the symbol marked on it—water, rather than Aturi’s air—was crumpled partway around his legs, as if he’d used it for a blanket and then thrown it off. Well, that answers that. I suppose he’s the roommate, after all. No answer. The sleeper remained firmly asleep. 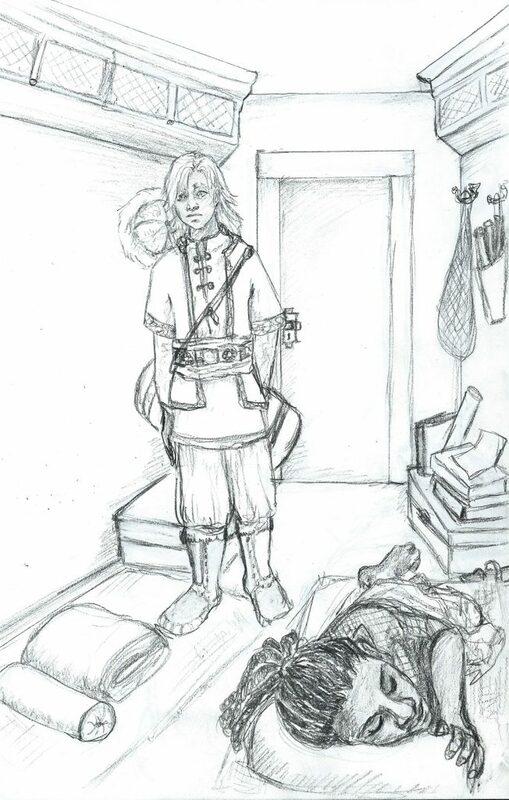 Aturi glanced around and saw that his roommate also had a rule-book, schedule, and supplies list piled up on the trunk at the foot of his bedroll. A haphazard stack of library books leaned against the side of the trunk. Maybe they do lend them out after all. Aturi craned his neck to read the titles. A World History of the Names of the Stars. That sounded interesting, but Aturi was polite enough not to leaf through someone else’s books without permission. Behind it, a title in a script Aturi didn’t know—not Shian or Rakhenai. Maybe a southern language? Advanced Theoretical Considerations Regarding the Constant Elements. This student’s area of study was water, one of the constant elements, to be sure, but he couldn’t be at an advanced level, could he? Aturi certainly wasn’t advanced in air yet. He only knew three spells—float, breath, and circle. The next book was titled Ancestor Tales of the Northern Tribes. It was written by a Shian author. How had he learned Han Khiru Ancestor stories? Aturi wondered if any of the stories were the same ones he and the other children in his band had learned in shaman school. With some difficulty, Aturi turned away from the temptation of his roommate’s books, emptied his pack and arranged his things in his new room. His spare clothes, mittens, and mending kit went in the trunk. He set his winter boots beside the trunk and hung his fur-trimmed winter hat on a convenient wall-hook. His soap went beside the water-basin in a corner of the room, and he picked another corner for his portable shrine. He didn’t unfold it, though. He wanted to make sure his roommate wouldn’t laugh at him for praying to Ancestor figures. None of the Shians he’d met so far seemed to have much use for religion. His roommate stayed soundly asleep, so Aturi sat in the sunlight by the window and read his Tower of Elemental Harmony student rule-book. It was very long. Some of the rules made sense, like when men and women were allowed to visit each other’s dormitories, and which spells students could practice in their rooms and which could only be practiced under controlled laboratory conditions. Other rules puzzled Aturi, like the list of which sections of the city students should avoid. The rules didn’t tell why those places were off-limits. Aturi wondered if, as in the wilder parts of Khaiyakhuru, capricious spirits or strange, magical terrain made for dangerous travel. Another confusing section explained in detail what colors students were allowed to wear. Aturi examined his winter boots, trying to work out whether the purple in the trim was within five shades of the prohibited Imperial purple. The sun began to lower and the light through the window dimmed, making any further examination of his clothing an exercise in futility. Aturi’s stomach rumbled. He remembered that row of wonderful-smelling food carts, from the University tour. Perhaps he could go visit one, though he’d have to find a money-changer first. His roommate still lay in exactly that same position, unmoving. Aturi wondered, with a sudden spurt of panic, whether he was actually sleeping, or whether something had happened to him. It seemed a long time for a nap. Aturi crept over and listened for breathing, holding his own breath in the process. He didn’t hear anything and, panic increasing, poked at the young man’s shoulder. “Past dinnertime,” Aturi said. “Um, I think I’m your roommate. I’m Aturi of the Dream Cave Band.” He put his hands together to make a polite bow, but his roommate, sitting up, stuck out his hand Shian-style. “We’re not actually barbarians,” Aturi said, stiffly. He’d already been the subject of rude remarks from both the tour guide and his fellow students. We don’t often get barbarians coming down here to study civilized magic. “The Han Khiru do have some well-known mages.” Well, one, anyway. Aturi had traveled to Shiahan with Mage Ubashi, since he was the only Han Khiru who knew anyone at the Tower and could make sure Aturi ended up where he was supposed to be. Aturi felt oddly comforted, hearing his own language in this foreign city. Even if it was mangled. “Of course I can. If you’ll help me practice my Shian.” Aturi had spoken more Shian today than ever before in his life.